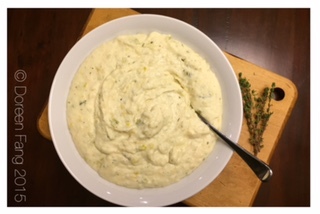 Keep hot mashed potatoes on the side until ready to add leek/thyme/Boursin mixture. In a medium heavy bottom sauté pan over medium high heat, add butter and oil allow butter to melt and heat, add leeks, stirring occasionally, cook till soft, approximately 6-8 minutes. Turn heat down to medium/low or low, slowly cooking and stirring leeks for additional 6-8 minutes. Add thyme, stir to combine, cook for an additional 12-15 minutes, continue to stir, do not let it burn. Add the Boursin cheese, stir till cheese is completely melted and season with kosher salt and pepper to taste. Add the mixture into the hot mashed potatoes, fold mixture gently into the potatoes until fully incorporated.